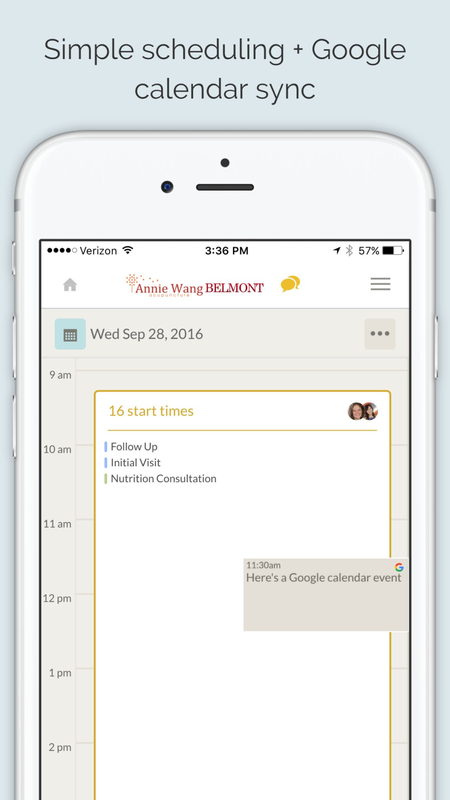 Simple, powerful, appointment booking tool that you and your clients will love! Use the scheduler anywhere: the app or any browser. Customers can book with ease using the Visibook app or online calendar. Easy booking and customer tracking. Reduce no-shows. Individual and class scheduler. Payments tool. Client messaging and notes. Simple, free set up. Control your schedule. Work around your personal calendar. Less email and hassle. Manage staff. Multi-Platform tool. Pros: I like that it is easily compatible with my gcal and with my client's calendar systems. I like that it clearly displays my availability to customers and that I can change my availability easily myself, and that clients feel that the system assists them in being flexible with their lesson times. I also like that it keeps record of cancellations, bookings, and sends reminder emails to clients. Cons: I wish it were a little easier to 'click and drag' availability in the calendar, or interface with the calendar directly, rather than going to an 'edit' function. I also wish I could reply directly to messages sent by Visibook. As in- when clients send messages from the Visibook software and I am notified by email, I wish I could reply in my email, and not have to go to Visibook before responding to the message. Overall: I am a sole proprietor of a business with one person in charge (me) and many clients that I am juggling on a weekly basis. When I began using Visibook about 15 months ago, it took a relatively short period of time to transition my clients to this new system, and I was amazed at how willing Customer Support was in assisting me and my clients with the transition. If ever there is a small issue with the interface, or if a client has difficulty with the Visibook system, Customer Support will be there to help guide through the process. I have also been a Visibook user through multiple iterations of Visibook, and believe that they consistently hear the needs of their users, and make good/helpful changes with each new update. I don't think any booking system will be 100% perfect 100% of the time with 100% of people feeling completely intuitively comfortable with every aspect of the interface, so that's my reason for the 4 stars in features + functionality. I have to say though, that their Customer Support, patience, and willingness to make their product more suited to their users' needs definitely supersedes any imperfection in the product itself. Pros: omg i cant live without this, i used it daily, for my customer to book an app or for me to book an app with them. love it how it remind me that i have an app coming up, and it also remind my customer as well. easy to used, love how it have a pay options as well, but it does take a fee, which is understandable. love how it has an url so that you can send to customers and let them know what you have open. Thanks for your feedback. We're happy to hear that the app has been so helpful for you. We would love to learn more about the times when you've seen the app add multiple customers accidentally. We've taken some extra steps to prevent that from happening, so I'd like to learn more about how you're seeing that. Can you please email us at hello@visibook.com? Pros: I like most about the program is that it is very simple for people to schedule an appointment. Everyone that I have spoken to about the program, says that is was very easy and it did not request a lot of information or request a signup to book an appointment. A big win! Also, I love the fact that it sends you an email or text notification when someone books an appointment an a confirmation message to the person that I have customized to include where I'm located and what to bring! They also have a great tech support staff that is very responsive. Cons: For me the program was not very intuitive. It was a little cumbersome to setup the available appointments. There were no online help feature. If you have questions you have to go through tech support via chat message. This is not that big of a deal, because so far their tech support has been great and very responsive! Within a few minutes they helped me rework my appointment schedule so that I could take off blocks of appointments with a few simple clicks instead of each appointment on a given day. I would of had to delete 15 daily appointments in a day for a 2 week period. Whew! Overall: I needed a very simple appointment scheduling program that people could use to request an appointment for services. Visibooks has filled that purpose. People that have been directed to the site have stated that it was very easy to make an appointment without having to wait or travelling to see if I'm available or not. I have been able to manage my time more efficiently since I have been using Visibooks. The email and text message notification is a real big win in my book. It also sends the person a confirmation message of the appointment. 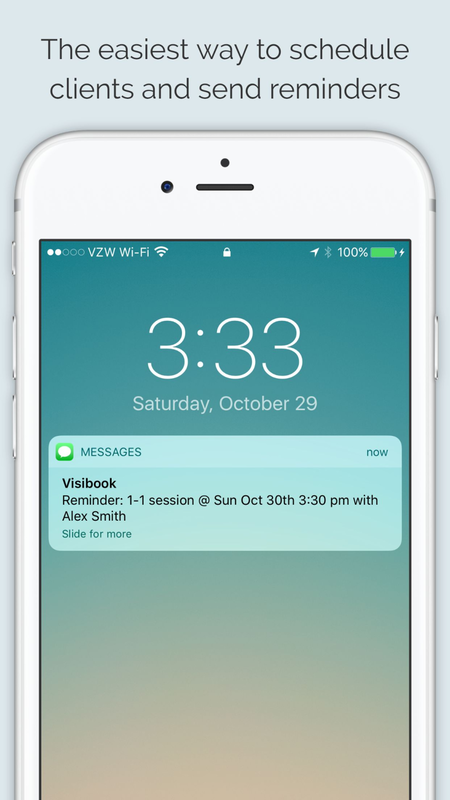 Whenever someone books an appointment, the program can send both and email and text message notification to you. It also sends you a summary of your appointments for the next day so that you can plan accordingly. Visibooks is a wonderful program. Recommendations to other buyers: Even though the program is not that intuitive, it is still a great program for scheduling if you don't need a lot of bells and whistles. Pros: So many things to like! But if I have to choose just one, I'd say it's the text reminders and notifications. My piano families receive text reminders about their kids lessons, as do I. I also have the option of sending notifications when I've canceled or rescheduled a lesson. Such a helpful feature for busy families! And one that is often an upcharge/add-on with other scheduling programs. Cons: I sure wish Visibook offered recurring group appointments. I can set up recurring one-in-one piano lessons but not recurring group lessons. Overall: I've used Visibook for years and have been very happy! Text reminders, fairly easy to navigate (sometimes through a little trial and error), clean-looking interface, and prompt responses to my questions. With the exception of the recurring group appointments, Visibook does everything I need it to and it's made me look more professional as well as saved me time in scheduling and rescheduling piano lessons. I highly recommend Visibook! Pros: This application is very simple but equipped with advance features. 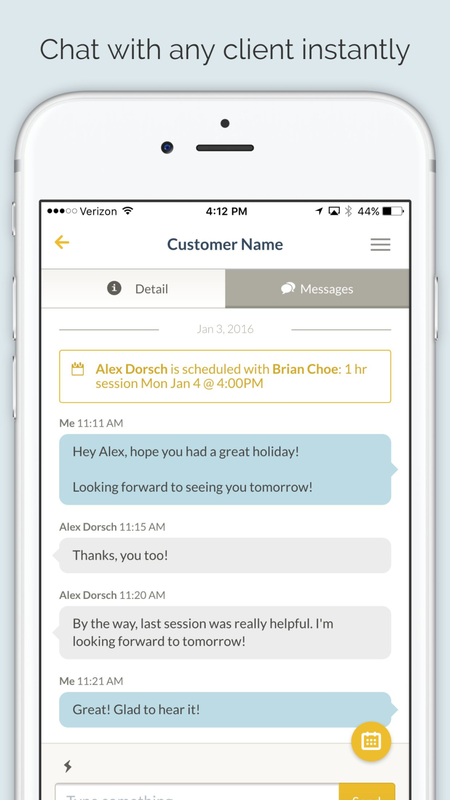 Users can easily book, make appointments, send reminders, chat (Service end and customer end). Can proceed with online payments method which makes both ends to proceed with jobs fast. This application is simple to use. Any user can simply involve with the system and continue with it. Cons: Not much, only issue is that this application lags, slows down time to time when running. Calendar functions should be updated as sometimes this crash when using calendar. Common issue. Overall: My company has some minor projects running apart from our main business range to expand ourselves. Here we are having a salon chain island wide. So far we have a over 5000+ customer base and Visibook is our main application that we are using to maintain customer relationships, booking, appointments, payments and etc. For over 1 year this application helped us to expand ourselves towards our goals. Thank you for your review. Can you please email us at hello@visibook.com with any details of situations where you've seen your Visibook calendar crash? Overall: We needed an option to keep track of dozens of students coming and going each week scheduled to different classes with the ability to send mass communications with changes and updates at a price that a brand new business could afford and we got all of that with Visibook. Could there be some enhanced features and functionality? yes, there could. But in terms of bang for the buck, Visibook is an option that is hard to beat. Overall: Visibook has made it possible for me to maximize the efficiency of scheduling. In addition I have clear records of past appointments for each client as well as overall statistics. The platform also allows me to have contacts of my clients available from everywhere and contact them easily. 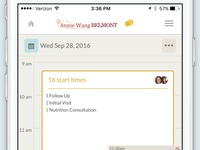 My clients enjoy the option to schedule their own appointments when needed or have reminders for their regular set up sessions. Whenever I have questions customer service is always immediately available through chat. All issues get solved immediately. Has made it to where I can just do my job....tutor kids. No more scheduling nightmares! Pros: The parents of my students being tutored can go in and schedule the appointments and even cancel them themselves. They can only schedule during times that I have marked as available. If another student signs up for that time, that time is no longer an option. I also love the alerts that I get for scheduled and cancelled appointments. The reminder the day before are great for both me AND the parents! I also love how my clients can leave me notes when setting up appointments. This works really well for my households with more than one kid. That way I know which kid to expect and prepare for. Cons: It would be nice to be able to customize a cutoff time for a client to schedule an appointment. As it is now, a client can schedule minutes before as long as there is availability. I use it for tutoring and need time to prepare for each student. I would like to be able to set it to where appointments had to be scheduled at least 24 hours in advance. Pros: I used Visibooks when I was working at a physical rehab center to schedule appointments with patients. It's a great tool because you can schedule using both you laptop and your smartphone and send reminders to your supervisors and patients as well. What was also nice about it was that you can share information on your social media accounts which I thought was a cool marketing tool. They also have a free version that works just as well (you can only book 40 appointments though). Cons: Sometimes the app froze and they do not currently have a phone number available for customer service. Overall: I loved it and would use it again! It's easy to use and affordable. Thank you for your review! Please email us at hello@visibook.com with any information about the app freezing. We'd love to learn more about how that happened for you so we can fix it. Visibook has been an essential tool for my new business. Pros: I can book appointments anywhere. I have the app on my iPhone, iPad, and my cash register (an iPad). 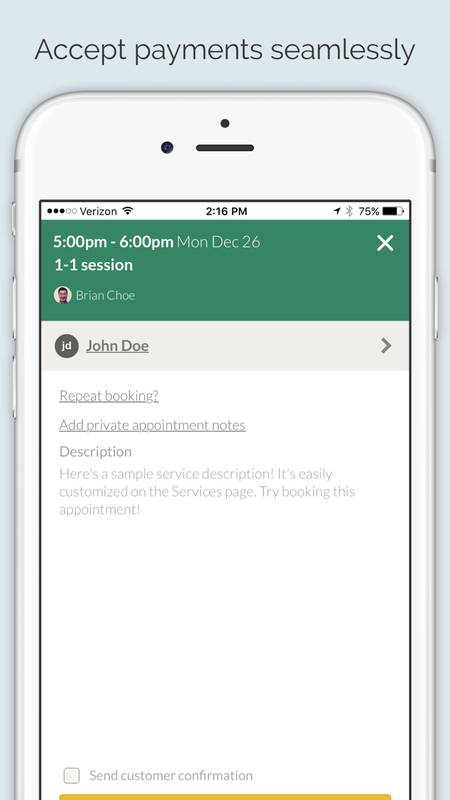 It's so convenient to be able to book appointments on the go without carrying around an appointment book. The app sends text reminders to my customers automatically. It alerts them when I book, change, or cancel their appointments. It also texts automatic reminders a day before the appointment. This helps to minimize no-shows and helps them to inform me ahead of time when they can't make an appointment. I can also decide how long my time slots are, how many customers can book at the same time, and what my availability is. Cons: There's a couple of things that would really make this app great. First of all, it needs an update to allow the orientation of the app to change for an iPad Pro. Also, I'd like to see a list of the customer names for each time slot on the main screen without having to click on each one individually. Very well needed program for my tax office. Pros: One Pro is price even though they raised the price since last year and lowered the amount of appointments limit. I can keep organized. Cons: Not very simple to use, to create availability and have it copy over to other days or use different times Not sure how to explain without showing what i'm speaking of. I cant make an availability for a 1 hour appointment to begin at any time of the day it's always on the hour.... You cannot change the reminder message to simply include an address to send to your clients. For what reason I do not know as of yet, but my clients are finding it very difficult to use. Thanks for your review :). We do offer payment processing. You can enable it from the main menu under "Payment Processing." Please email us at hello@visibook.com if you have any other questions! Visibooks offer me everything I was hoping for to manage my small seamstress business. Pros: I like the built in messaging feature. My clients are always super impressed that it's so easy to get a hold of me! I have also received fabulous feedback from my clients about the reminder sent to them the day before their appt. I also like the daily email summary I get on the day before my appts. Cons: Sometimes the messaging function mixes up the message order when the message is longer. It'll send message 3 before message 1 comes thru. The odd time it has been over an hour before message 1 comes thru and I can make sense out of my clients request. Overall: I no longer have clients missing appts thanks to the reminders! It also helps put forth a professional, modern approach to booking appointments. Pros: Love the text reminders, and customer service. Cons: I can't book multiple appointments at once (example - cut & color). It's a hassle to cancel an appt then re create it instead of just "moving" the appointment. And it would be wonderful if my clients could view all my prices up front on some kind of "home page" or something instead of having to schedule a time then click book in order to see the price (that has been my biggest complaint from clients). Overall: I had to switch from a previous website last minute and the people at Visibook made it very easy to do so. I love that they have the live chat constantly so I can always ask any kind of question. The text reminders are my favorite aspect of this website. The price is wonderful and I've been very happy. I've been in contact with them and told them things I would love to see happen to make it easier to use (especially for my business in particular) and they have assured me things are in the making to have the changes made. It's been a few months and I haven't seen any yet but am really looking forward to seeing them soon. Overall very pleased with Visibook and especially pleased with their customer service! Recommendations to other buyers: This software is excellent for me to book for my clients, but when it comes to my clients booking for themselves it seems a little more complex and work (again this may be just for my particular business). Visibook made easy for my clients to sign up for the classes, so it helped our bottom lines. Pros: We have looked many appointment booking apps in the past. Some might have a lot more bells and whistles, but it was complicated and expensive. Then, I found Visibook through Capterra and it was a great fit for us. It's fairly easy to use for us and our clients using Google credentials. It has a great pricing for startups, but provide flexibility to use multiple accounts for several locations. They have provided a professional and timely customer support for any questions you have. Cons: I have voiced this numerous times, so hopefully they will hear me again. 1. we can't stop clients signing up last minute. It has cancellation limit (we set it as 24 hours), but we can't not for signing-up which brings a lot of trouble. 2. One profile can't have several members under one profile. We have a class that multiple siblings can sign up together, which means if parents have 2-3 kids, they have to manage 2-3 profiles. 3. I can't convert the data to .csv file. I think that could be done fairly easily, but they have no desire to do that. Overall: We could easily predict the size of the class and be able to communicate easily with the clients and teachers who teach the class. The best online booking system out there! Comments: What an awesome system! I've tried several online booking systems in the past, but so far Visibook has been the most robust! They have helped me save time, money, and grow my business so I can focus on what I what rather be doing - seeing patients! I own an acupuncture practice with 2 locations and multiple practitioners. 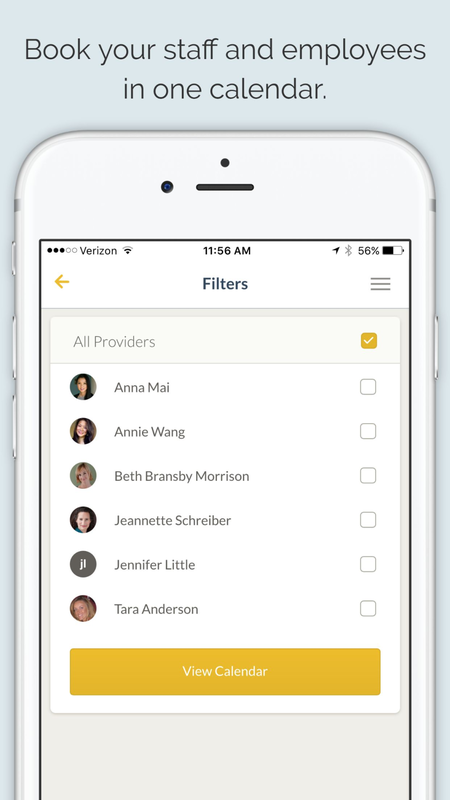 Visibook is easy to use for me and my staff, and allows our patients to book/cancel/manage their appointments 24/7. Patients often tell us how much they love our booking system - part of the reason I still use Visibook after 2+ years. My staff likes visibook too b/c they have their own logins & passwords to have privacy and be able to manage their own schedule. The costumer service is excellent! I like how I can just click on the bottom left to report an issue and contact costumer service directly (no need to navigate the site to find costumer service). We always get a speedy response and our problems are resolved quickly! They also have a mobile app which I'm extremely happy with! I can basically handle my booking requests and correspondence wherever I go. One thing they offer that I haven't used to much is performance tracking. So I can't comment too much about that, but it's great that they're offering more for their clients at a very reasonable cost. I couldn't be happier with a booking system like visibook! Thanks for the review, Annie! Happy that we're able to help you with your scheduling needs! Visibook is quick,easy and convenient! I started using this for my voice lessons my clients love it! Pros: I like that my clients can use it with ease. It almost feels like a personal assistant! I love that I can message my clients right from the app and that it sends reminders to my clients so that they don't miss a lesson. I also love that whenever I have a question, I am able to chat with the help desk right away and get the customer service that I need! Cons: I wish I could send one email or message to all of my clients at at once. I would also like to be able to set auto messages. So that when a new client registers for a class they automatically get a personalized message from me thanking them for signing up and giving them initial instructions as it pertains to their first session. Overall: Easy set up and scheduling for over 30 clients. No stress by trying to keep track of appointment's! Pros: I love that Visibook makes my calendar a constant access for my clients! It is viewable from the same link, shows all of my availability and allows me to communicate directly through the app when clients have questions. The best part is that I receive an email, text and push notification each time a client books as well as a 24 heads up for my next day appointments! Cons: I wish there was a way to customize my breaks in between sessions without it being a mandatory 15 min increment. I'd do 10 min between each session. Thanks for your review! And I've made a note of your feature request! Pros: Overall, it's pretty user friendly. I use it for a training schedule so it's a little different than what most clients probably use it for, but it has made it a lot easier for my trainees to find a date/time that suits instead of having to email back and forth to find a time to schedule a training appointment. Cons: If you're not the most tech savvy, using the software can be slightly confusing. Overall though, it's not difficult to manage. Program has increased patient flow and they love using it! 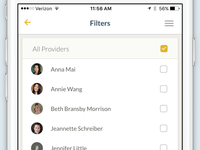 SO MUCH better than our old way..
Pros: That patients can CX and RS their appts based on their schedule.Program is user friendly and we like that we can message patients through this. Cons: Every so often, the office staff is unable to get on program via our cell phone when out of office.There has been an occasion that a patient can't CX appt..but not very often. Overall: The program is in line with how people like to do appts online and due to work or other issues, they are not always able to do things by phone. This is the best calendar for small business owners! Pros: Easy of use, the responsiveness of team, and I like the look. Cons: Every time I point out something I think could be improved, you guys do it! Overall: Flexible, responsive and user-friendly - Visibook has made my life so much easier. From easy booking myself, to easy booking for my clients, to complete control of my calendar and support that is out of this world (I asked for the app to include a landscape view and it happened within a few days) you can't find a better group of people to work with or a better product. Pros: Great for putting private notes in as I use it for address' and phone numbers when out and about. I also get my emails or my calls the next day wihich I print out for myself.and very easy to use. Overall I'm very pleased with it. Cons: I would like when the email comes through it would have the private notes with the names as I write the addresses and phone numbers on it myself. Also an option to notify me to my phone when my next call is coming up. Overall: Overall I have a very positive experience with the app and wouldn't do without it now. Pros: Easy to use, accessible with iPad, iPhone, and computer. Love the email and text reminders. Cons: I only wish there was it was capable of two emails in the client profile. But the new text reminder feature has resolved some of the need. Overall: I never write reviews. However, I really love this app! I have tried so many scheduling apps over the last 3years, each one had something missing that I was looking for. I found visibook and figured I'd give it a try. I found a gem! My clients love it, easy for them to schedule appointments, they all tell me they love the reminders. The functionality has cut down on phone calls to schedule appointments and cut down no shows. Customer service is awesome; friendly, prompt, and accessible. Get visibook!!! you won't be disappointed!! Recommendations to other buyers: You guys have really knocked it out of the park!! Can't think of anything that could make it better. Pros: It's efficient and helps me stay organize and My customers benefit from it as well. Also, I wish I could make my own reminders to my customers not just the reminders that come automatically with the app. Overall: Excellent. The program itself is exactly what I need for my business. Always easy to deal with when I have an issue or want to make a change. Thanks for al your support. Thank you for your feedback. I'll make a note of your feature request. We'd love to look into the issues with your phone not loading. Can you email us at hello@visibook.com? A great first time starter appointment app. Cons: I work at a salon and I have to send out reminders the day before the appointments because if I put in the appointments weeks ahead then the clients will Recieve appointments everyday until their actual appointment date. Thanks for your note, however what you described sounds unusual. We send out a reminder 24 hours prior to the appointments; not everyday in between. Can you email us at hello@visibook.com? We'd like to help look into what you're seeing. Cons: I have no cons to report. It's a great software and everything is great about it. Overall: Software is amazing and my overall experience is great all my customers love it. We're so happy to hear that Visibook is working out well for you and your customers! Thank you for your review! Pros: Having used a few other online scheduling systems such as MindBody, Visibook is head and shoulders above anything I've used. For me simplicity is the key. Overall: Visibook has been the backbone of our scheduling system. We're constantly changing appts multiple times a day. Without it logistically our business would be a nightmare. Recommendations to other buyers: The founders have been great to work with and super responsive to any suggestions we've made. Won't use anything else!!!! Best scheduling app I've tried! 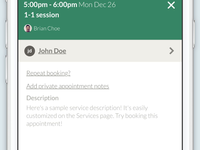 Pros: Easy set up, really easy to navigate the app and book appointments, easy to add and edit customers. Love the confirmation texts sent out to clients the day before the appointment, and that they can respond directly to the confirmation text if they need to and I get notification sent straight to my cell phone. Super simple to add, edit or cancel appointments and they give you the option to send any adjustments to the client directly. Really affordable app, that literally does everything I need. Cons: I'd like the option to be able to state why I'm closing off a day (eg: vacation, jury duty, etc). sometimes the app will get glitchy and won't let me edit the appointments, so I end up having to cancel the entire appointment and rebook, instead of just being able to do a simple edit. The confirmation sent out the day before the appointment would work much better for me if I could send out a completely custom text, asking the clients to confirm, and it would show on the schedule that the client has confirmed the appointment. Pros: I love that I send interested clients my link (which they can also find on my website), and the only thing that they see are available openings. We both get a confirmation email and/or text. We both get reminders and they can cancel or change their appointment without having to pick up the phone. It saves so much phone time. They can also message me through Visibook. Cons: When they message me I get it as a text but I have to go to Visibook to answer the text. Thanks for your review! We appreciate it! I never forget to keep appointments. Pros: I use Visibook to manage my meetings and activity for the day. 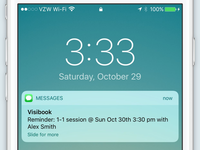 Since using Visibook, I have never missed an appointment because I forgot ,nor have I had to arrive late for an appointment because I didn't remember early enough. I love the automated sms and email reminder which I receive from Visibook regarding my daily schedule. I love this feature,so likewise my partners too. Cons: Great all round schedule management program. I have had no reason to consider halting my usage since I adopted it early 2017. Pros: The software is very easy to use and it makes my business run more efficiently. Cons: Every once in a great while when I first used Visibook, it wouldn't load quickly but it hasn't happen since. Overall: At the beginning I had a couple of questions and their staff was quick to get back to me and answer my questions. Thanks for the positive review and feedback! We appreciate your support! Cons: Full calendar invite between customer and company representative would be good so that we can see when someone accepts the invitation directly in the invite. (But I do recognize that it is redundant when the customer is requesting the appointment via Visibook on the first place). Pros: Even with poor connection it works extremely fast. Great Value! Apple and Android adaptable! Love it. Overall: Visibook is definitely my receptionist. Good. Just want more options to over lap appointments and no show protection. Pros: Private notes so I can keep track of client progress and payment. I like that there is client access to make any cancellations on their end. Cons: I don't like that there is not an option to book ongoing events when booking a single appointment. I wish that when booking a client I could book the same appointment in upcoming weeks without having to go to each individual day and book. Hi Kelly, when you are booking an appointment, at the bottom of the booking panel, you will see an option to repeat the appointment. Hope that helps! Thanks for your feedback Marcie! I'm a Stylist and have been using this app for a year. Pros: I love that the software is so easy to use and I can schedule anytime and anywhere. Cons: This question doesn't apply to me, I love the software! Overall: I have been a Visibook user for years and it was great when I started using it and even better now. I've recommended this software to so many people and will continue to do so in the future. Thanks for making my job a lot easier. Pros: For a low price I was able to track all of my client appointments. Rescheduling was easy and tracking other trainer schedules was simple as well. Overall: My overall experience was very good. The app is definitely easy to use! Our tech support has always been the same and we always respond to every inquiry. If you've sent in an inquiry and it has been answered, please send an email to us at hello@visibook.com. Pros: What I liked most about this software is that it is easy for my clients to use and myself as well. It's nice to have a software you can count on to do the "thinking" for you when you have a million other moving parts to focus on. Overall: I love Visibook! I raved about it to my colleagues and one immediately signed up and is just as happy. Visibook has become my tried and true co worker that is always there and never lets me down. Over 2 years using Visibook and it keeps my businness very easy. It is amazing app to scheddules. Pros: It can be used direct by the client, and also sends reminders to them and to me Also, it can be shared with privacy. Cons: It can not send email to all clients at the same time and we can not write a breve information together of the name schedduled, like a only word, or kind of procedure. those would be pretty usefull. I love this little app. It's so quick, and does most things I need from booking software. Pros: Integration with Gmail. The fact that you can name your 'account' as anything you want, so people can easily find your business. Overall: Ease of booking for my corporate clients. Clear appointments, and notifications. Pros: feels good flows nice. Overall: i only used Visiobook for about 2 weeks as an experiment as my business was not quite ready to fly yet. wanted to test its features. ease of booking for clients. for my needs to run a small bookings from my fone and computer. what i would like to see is a easier way for me to create and add bookings that dont take as long. the problem is for me is atthis point i do not have repeat time slots so it take too much much time in one sittinf to create available slots. in the end i needed to write them out and just txt them to clients. like a simple highlight and clicking? unfortunately the one time i got a customer service email about why i was not using it ... i explained my problem but did not get a response. i did not pay anythig for my use. all in all i say its very promising and look forward to its developmemt based on client suggestions and continued refine ease of use and i tuitivenes. Thank you for your feedback. When you are setting your availability, on the step after your select your services, users are presented with an option to "Repeat This Availability." Should be highlighted in red. Sorry we missed your earlier email. Please feel free to reach out to us through Tech Support with any further questions! Pros: It's easy to use. It contacts my clients for me. I love the different colors for different services. Booking is easy! Clients message back easily. I like that it reminds me of my schedule. Overall: I really like how easy it is and I've never had any problems! Pros: This app is totally fantastic! I especially love the reminders feature. With other apps it can get very annoying, but with this one, I gladly welcome the reminders. keep it up. Cons: If only it could work offline...It's the only downside. Overall: What a great scheduler, especially with my OCD tendencies. I'm always so organized thanks to this. I manage to keep up with my daily activities. A big up to the creators of this fantastic app. Thanks for your review! We'll keep thinking about how we get things to work offline. Pros: Ease of use, auto reminder, customer service. Cons: Not able to register different patients under the same email address. Overall: I love ease of use, auto reminder function, customer service, etc. the only thing I would like changed is I'd like to be able to register different patients under the same email address - for families with small kids and elderly who don't own their own email address. Pros: I love that it sends clients reminders the day before a lesson. It is very easy to share via text or email. Lesson tracking is extremely helpful. 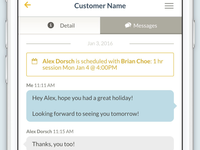 Overall: Visibook has been a fantastic way of allowing me to share my schedule with member and nonmembers. Thanks for your feedback. Sorry to hear that the app can be slow sometimes when opening for you. Are you an Android user? If so, can you contact us at hello@visibook.com and let us know which phone you're using? We'd love to look into it a little more and see how we can make it faster for you. Pros: It's easy to use and if I have questions there is Teck support and I get a response back within 15min. Usually. The email reminder and sled bookings for clients helps save me time. Cons: The text messaging doesn't work in Europe(were overseas for work) I can not book personal appointments without making it on my actual list of services. It would be nice to be able to use this only calendar. Even though it connects to google calendar it only shows appointment on google not when I look on visibook. It would be nice if they showed the same view. Overall: I can not tell you how helpful this app is for my nail business. I get notifications when people book, it send reminders and is SUPER user friendly. Thank you guys so much for all the Teck support(I ask a lot of questions) response time is quick!! Price is way too cheap!! Shhh don't tell them! I pay for the 150 booking a month if I had to pay a receptionist for the same time it would be so much more. Thank you, thank you! For making my work load that much easier. Recommendations to other buyers: Get this app fast!! Great money saver, time saver and easy to use!! Pros: Clients find it the most easy to use out of all 3 types of online booking software we've used. The price is also very reasonable. So far we've had no glitches as well. Cons: I have no cons, this software is priced well, works well and clients love it! Overall: Visibook makes it easy for clients to book with us as we do not have a receptionist and often can't make it to the phone. Visibook saves us a lot of work and headache. Thanks so much for your awesome feedback and support! It is enough for my needs right now. I do not need a lot of features. Pros: Free. It links to my Google Calendar. Easy to use for me and my patients. Patients are able to text me directly. Cons: No landscape mode on iPhone. Unable to adjust notification time to notify patients. Sometimes it is hard to select the correct slot whenusing the iPhone or iPad.